Just like residential roofs, commercial roofs can experience troubles over time. Factors like roof condition, weather, surrounding environment, and the quality of the roofing materials and installation are all relevant to the durability and life expectancy of your commercial roof. While it is impossible to make your roof impervious to damage, it is possible to delay costly replacements and make the most of your investment by staying up-to-date on maintenance. To help with your ongoing maintenance, we at Tim Leeper Roofing would like to share with you some common problems that you should be looking out for. 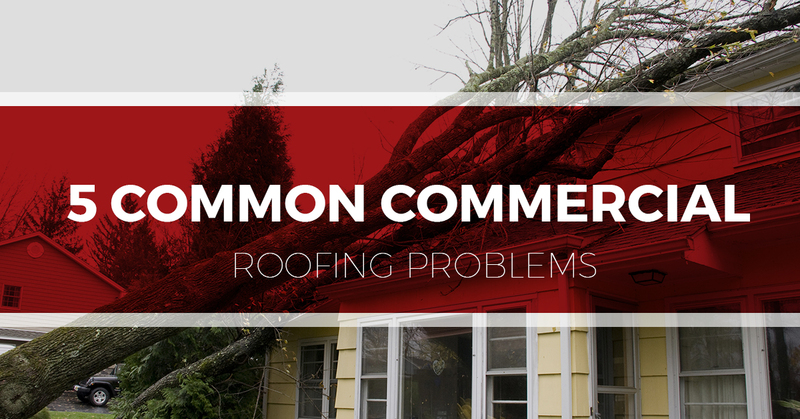 If you spot any of these problems with your commercial roof, contact your local commercial roofing contractor—if you are in the Nashville area, contact us! We have earned a reputation for providing unrivaled commercial and residential roofing services. Learn more about our services and contact us today to get your free, speedy quote. All roofs are susceptible to leaks and moisture damage—after all, out of all the parts of your home, your roof receives the brunt of the force of weather. The effects of a leak or moisture infiltration can be detrimental, and it is crucial to never leave a leak unattended. If you have a leak, contact your roofing company. Issues that are not resolved can lead to much larger and more costly issues. Often caused by a clogged drain or poor roof design or installation, pooling water on your roof can quickly deteriorate your roof, causing leaks and other damage. In fact, the National Roofing Contractors Association has stated that allowing water to pool on your roof for more than 48 hours can pose a serious threat, especially to the structural integrity of your building—the additional weight can potentially cause the roof to collapse. Good commercial roofing repair contractors will look for ways to address proper draining, which might include adding drains and tapered roof insulation. Flashing is installed around walls, curbs, and protruding objects like chimneys and pipes. Though small, flashing plays a vital role in the functionality of your roof by deflecting water and keeping it out of seams and joints. Experts report that an overwhelming majority of leaks occur due to faulty flashing. Oftentimes, this is not always because of improper installation but rather because expansion and contraction that can occur, creating gaps and causing tears and breaks. For flat roofs, this is a very common problem. Like virtually anything that is left out in the elements and subject to intense sunlight and weather, your roof is susceptible to surface breakdown, erosion, ridging, splitting, blistering, and other types of damage. These problems can arise with all types of roofs including commercial and residential single-ply systems, metal roofs, flat roofs, and virtually every other type of roof. If you begin to notice these effects, contact your local roofing company immediately. Though this can be an infuriating problem to have—no one likes paying hefty sums for an unsatisfactory service—it is important to address these issues promptly. Faulty installation can drastically reduce a roof’s life expectancy and overall effectiveness. When a roof is not installed correctly, it can cause a number of failures such as billowing, blow-offs, and premature roof aging. One way to decrease the likelihood of this problem is to be extra careful when selecting your commercial roofing contractor. Be sure to read reviews, ask questions, and do your research. This extra step can save you a shocking amount of money in the long run. Here at Tim Leeper Roofing quality, honesty, and superb customer service are points of pride for us. Whether we are installing a metal roof for a commercial space, an asphalt roof for a residential home, or simply performing a routine roof inspection, we are relentless in our pursuit of perfection and doing all we can to keep our loyal customers safe and satisfied. If you notice any of these problems while carrying out your commercial roof inspection, reach out to your commercial roofing company. As we’ve mentioned, commercial roof replacements are costly, and the surest way to maximize roof life is to be proactive and have a maintenance program in place. This type of program can be the difference between a small, relatively inexpensive repair and a burdensome, expensive replacement. Contact Nashville’s top commercial roofing contractors today to set up a consultation or to get your free estimate!